Kasungu National Park – Travel Guide, Map & More! Kasungu is Malawi’s second-largest national park. Once teeming with wildlife, the park has been heavily poached and animal densities are low. There is only one lodge, well priced and located at Lifupa Dam. The dam has some resident hippos and is a magnet for animals, especially elephants, at the end of the Dry season. Morning and night drives are offered. If wildlife viewing expectations aren’t too high, Kasungu offers a great bush experience. Although ongoing poaching has depleted wildlife numbers, Kasungu still has a good variety of animals. Though black rhino and cheetah are extinct in the park, four of the Big Five are still present. Elephants regularly come to drink at the dam. Buffalo can sometimes be found as well. Lucky visitors might see a leopard on a night drive, and lions might be heard but they are rarely seen. Antelope species include the rare Lichtenstein's hartebeest, greater kudu, puku, sable and roan antelope, and reedbuck. The lodge and campsite are located in a beautiful spot overlooking Lifupa Dam. Sunrise over the lake is particularly evocative with rising mist, hippos snorting, fish eagles calling and waders bobbing around the shore. The rainy season brings a variety of flowers including different orchid species. Those feeling energetic can climb Black Rock for the best views of the endless expanse of bush, and to see the sunset. Kasungu can be visited throughout the year, but the best time for wildlife viewing is July to October, from the middle to the end of the Dry season. At this time, animals are drawn to Lifupa Dam to drink. Kasungu is quite accessible, and Lifupa Lodge can usually be reached in any type of vehicle. 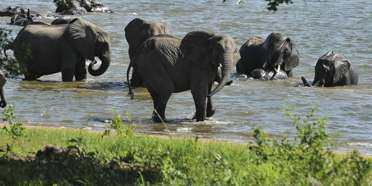 The park is about 170km/100mi from Lilongwe, and the drive takes about three hours. Want to Visit Kasungu NP?